The S & E #3 was valued at $600 and was a total loss along with her cargo. The cargo was insured for $3,000. The vessel had no insurance. There was no loss of life. SAMANTHA G (1984) The 74 foot vessel Samantha G burned and sank September 2, 1984. 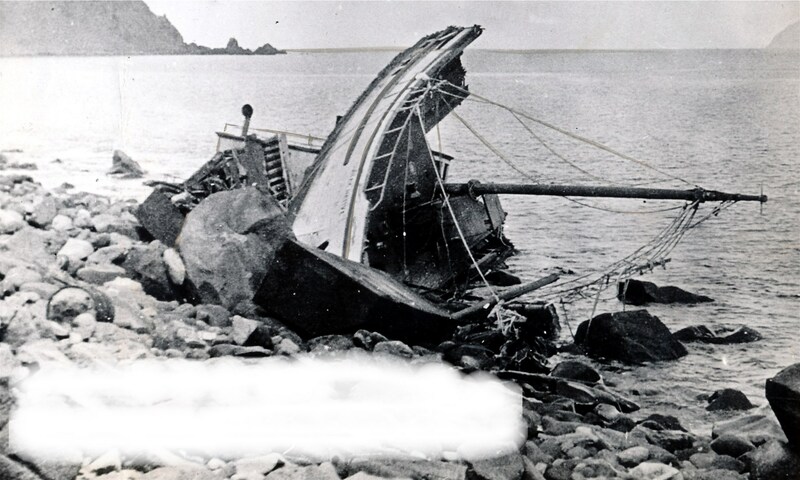 SAPPHIRE (1897) The 109 ton sealing schooner Sapphire was destroyed by fire 20 miles offshore from Ucluelet. Aboard the vessel were captain William Cox and three crewmen. The Sapphire caught fire, which quickly spread and ignited her powder kegs. The crewmen aboard narrowly escaped before the explosion. There was no loss of life. SAPPHO (1882) The 263 ton bark Sappho was stove in by ice and became a total loss while whaling in the North Pacific May 6, 1882. The bark departed on her whaling voyage from San Francisco December 25, 1881. The vessel had a value of $25,000 with her cargo of whale oil and bone. The disaster occurred off Bukhta Provideniya, Chukotka, Russia, northwest of Saint Lawrence Island, Alaska. SARAH (1879) The 142 ton two masted schooner Sarah became a total loss while cod fishing in the North Pacific in 1879. The vessel was owned by Lynde and Hough of San Francisco. SARANAC (1875) The side wheel steam ship Saranac was lost in Seymour Narrows June 15, 1875. The vessel with her 10 guns and crew of 300 men was out of San Francisco on a trip to Alaska to collect curios for the Centennial Exposition. She was running at 14 knots when she struck heavily on her port side and began filling rapidly. She was headed for Vancouver Island where she was grounded among the rocks. No lives were lost. SEA LION (1895) The 51 ton Canadian sealing schooner Sea Lion was lost with all hands in the North Pacific in 1895. SEA WITCH (1907) The 1,289 ton bark Sea Witch became waterlogged and was abandoned by her 16 crewmen on December 6, 1907 at Lat. 45 41 N Lon. 127 30 W.
The Sigrid had a value of $2,500 and the ton of supplies on board was worth $200. The vessel and half her cargo were lost with no insurance. There was no loss of life. SIMEON I ANNA (1797) The Russian vessel Simeon I Anna was lost in 1797 on her way to the Pribilof Islands from Okhotsk, Russia. SOPHIA SUTHERLAND (1900) The schooner Sophia Sutherland was lost in the Arctic August 31, 1900. The vessel was towed into Baillie’s Island, Northwest Territories, Canada by the steamer Beluga, where she was lost in a gale. STAR NO 71 (1942) The 39 ton 61 foot wooden scow Star No 71 foundered in Alaskan Waters September 15, 1942.